Airey wrote this book as a crossover because, at the time (the late 70s), there were no Doctor Who fanzines and her other love was “Star Trek” (The original version). The very first version was printed in the ST zine “R&R XII.” The illo of the Doctor (Tom Baker) was done by an artist who had never seen the show and looked like a bescarfed Bob Hope. As DW fandom evolved in the early 80s, Airey revised and published the story with illustrations from some young artists who had watched the show. It was not intended as a “parody.” The planet visited is, indeed, intended as a salute to Marion Zimmer Bradley’s Darkover series — something that many media fans did not realize. As mentioned below, this version is available for free. Please read it and not the other! Any version that has The Wizard Of Oz in it is an unauthorized version. American publisher Pioneer Books (which specialized in unofficial reference books based upon various franchises including Doctor Who and Star Trek) issued a trade paperback edition. The Second version of the book was edited to, in theory; remove all references to copyrighted characters and races. Captain Kirk became simply “The Captain”, while Spock became “The Scientist”. The Doctor, however, retained his name. This editing was not perfect, and a reader will notice occasional accidental references to Kirk, etc. slip through. 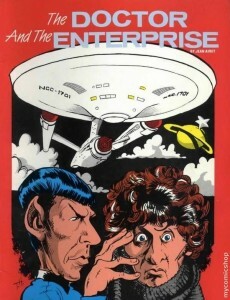 This version was illustrated by Mahlon Fawcett and Tom Holtkamp, and the artwork rather unambiguously features the USS Enterprise, the TARDIS, and a likeness of the Fourth Doctor based upon that of Tom Baker. So while it is amazingly awesome that IDW is doing what they are doing, there is a published version from Pioneer Books that if you really want an awesome Star Trek Doctor Who Cross over, then this is the one you are going to want to find. In the mean time, I am digging out my own copy and am planning on enjoying it today. Sadly, we have to wait for the IDW version.